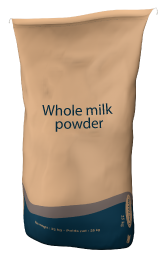 Whole milk powder is obtained by spray drying pasteurized milk. It contains between 26% to 40% milk fat (by weight) on an “as is” basis. Vitamin fortification of whole milk powder is available and feasible.